Operating Ireland’s largest fleet of car transporters, National Vehicle Distribution (NVD) is the ideal strategic partner for all logistics, transport and secure storage solutions. The award-winning company is continuously strengthening and consolidating itself as the main supplier of vehicle and storage solutions in Ireland and last year opened a new Vehicle Preparation Centre and a dedicated HGV Workshop at its Baldonnell base. Providing an integrated service in automotive transport, storage and vehicle preparation, NVD has come a long way since it was established in New Ross, Co. Wexford in 1980. It’s now a third-generation family business with Andrew Boland and son John holding the key positions of Managing Director and Director of Operations respectively. They are joined by over 350 highly-skilled staff comprising 170 drivers as well as compound, workshop and administration personnel. With a huge fleet of 145 trucks and 137 trailers, NVD is the dominant player in the Irish car transport sector. NVD’s transporters operate throughout Ireland, the UK and mainland Europe providing direct deliveries from factory to dealer. The company also provides a dedicated dealer-to-dealer service within Ireland and between Ireland and the UK. The mainland Europe countries it operates in include France, Spain, Germany, Holland, Switzerland, Italy, Austria and Croatia. The ISO certified company provides a range of services including transportation, body repairs, pre-delivery inspections, vehicle conversions and enhancements along with monitored 24-hour secure storage. With 75 hectares of secure storage, NVD has the capacity to hold in excess of 35,000 units at its facilities in Rosslare, Co, Wexford, Ringaskiddy, Co, Cork, Baldonnell, Co. Dublin and Kill, Co. Kildare, all of which service Ireland’s main ports and facilitate vehicle shipments from all over the world. Through NVD’s Real Time Service, customers can view and manage the vehicles stocked at its compounds from their own PCs and devices, enabling full stock control while freeing up space at their own premises with full visibility of all vehicles at all times. At NVD, all services are tailored to meet and exceed your exact needs, guaranteeing you the ultimate in flexibility, an effective and efficient service and a wealth of experience that you can depend on. The company’s state-of-the-art facilities make them the first choice in handling both new and nearly new vehicles. Committed to its customers and partners, which includes all the main car dealerships, and assuring ongoing attention to detail, NVD’s core values are honesty, openness, personal excellence, highest standards and progressiveness. The company’s promise is to be courteous, professional and serious about servicing its customer’s needs. Pre-delivery inspection, hire drive preparation, van conversions, workshop services, plying lining and vehicle enhancements are among the most in-demand services provided by NVD. The company’s facilities in Rosslare and Baldonnell provide customers with the most efficient and best quality PDI solutions currently available on the market. Established in 1984, NVD’s van conversion facility has grown to become one of the largest in Ireland, carrying out conversions for new and used vehicles and ensuring a top quality professional van conversion tailored to its customers’ requirements. From minor repairs to model upgrades, the family-run business provides all workshop solutions. Paint and bodyshop facilities are an integral part of its workshops in Baldonnell, Rosslare and Ringaskiddy. NVD is in the unique position of being able to provide a complete one stop service with beneficial add-ons such as collecting and delivering units, high volume processing capability, a network of workshops and high-profile, quality clients. It also has the ability to retrofit or enhance any unit to manufacturer’s or dealer’s requests. Following his appointment as HGV Fleet Maintenance Manager in October 2015, Michael Morgan carried out a review of NVD’s HGV fleet maintenance programme which culminated in the opening of a new Truck Workshop in June 2016. It coincided with the opening of a new and expanded Vehicle Preparation Centre on the adjacent site of the former Pratt and Whitney aircraft engine casing repair facility. “On completion of the review, we made the decision to bring all truck & transporter maintenance activities back under NVD’s direct control and develop a full service in-house HGV maintenance facility at Baldonnell. To manage the transition from outsourcing to in-house required the team to essentially juggle between managing the fleets daily maintenance requirements in parallel with the development of our in-house workshop, ‘’ he explains. Michael said the team’s persistence and passion were central to carrying the project through to completion. “From the start, my team members, Barbara Maric and Barry Martin, the entire workshop team and all of the internal stakeholders I worked with made this initiative a success and one I’m very proud to have led,” he added. 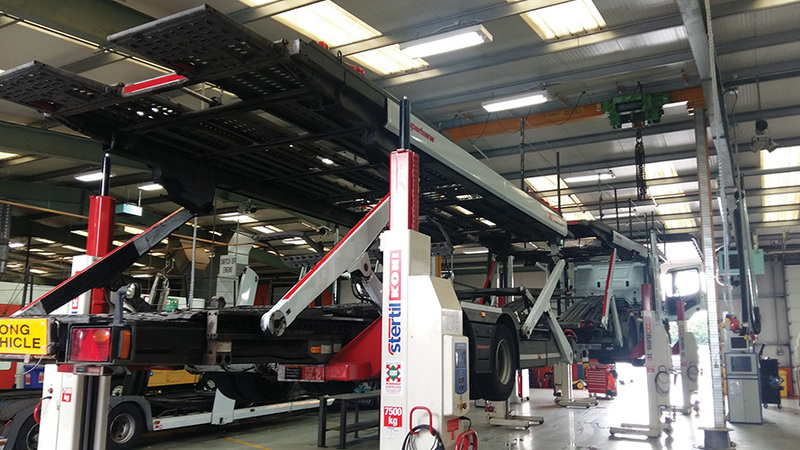 The new workshop is fitted with state-of-the-art equipment such as Koni vehicle mobile lifts, Gates hydraulic hose assembly tooling and a 21.5m inspection pit fitted with a Maha brake tester to carry out pre-CVRT tests. The company outsources all its tyre requirements to Bridgestone Ireland and all truck and trailer parts supply and stocking to MTTS (Midland Truck & Trailer). Over the last two years, NVD have made a significant investment in both upgrading the transport fleet and developing a full service in-house maintenance capability at Baldonnell. ‘’I see the company continuing to invest in the people and resources required to maintain this fleet as a best-in-class fleet,” Michael concludes. As mentioned at the outset, NVD is an award-winning company. It scooped three major awards in 2017 – Large Company Category Winner (European Transport Safety Council – PRAISE Award), Company Driver Safety Award (Brake Fleet Safety Awards) and Freight Transport Association - Gold Standard Award.